Not to be confused with iPad Air 2 or iPad Mini 2. The iPad 2 was available in black and white. Front: Video recording, VGA up to 30 frame/s with audio, VGA-quality still camera, 0.3 MP. Back: Video recording, 1280x720 up to 30 frame/s with audio, 960×720 still camera with 5× digital zoom, 0.7 MP. The iPad 2 is a tablet designed, developed and marketed by Apple Inc. Compared to the first iPad, as the second model in the iPad line it gained a faster dual core A5 processor, a lighter build structure, and was the first iPad to feature VGA front-facing and 720p rear-facing cameras designed for FaceTime video calling. The device was available initially with three storage sizes – 16, 32, and 64GB – and two varying connectivity options – Wi-Fi only or Wi-Fi and cellular. Each variation of the device is available with either a black or white front glass panel. However, upon the release of the 3rd generation iPad in March 2012, only the 16GB variation with two connectivity options and two front color options remained available. The product became available in March through May 2011. The device received mixed to positive reception from various blogs and publications. Although it was praised for its hardware improvement, such as the new Apple A5 chip, the software restriction on the iPad 2 and iOS in general drew criticism from various technology commentators. The device sold well in its first month of sales with 2.4–2.6 million units sold and 11.12 million units were sold in the third quarter of 2011. A popular product, with a lower screen resolution and performance than the two Retina models that followed it but a lighter build and longer battery life, it remained in the Apple line-up as an entry-level iPad model for three years until March 2014, latterly with a silent upgrade to a die-shrunk version of the A5 processor. Its basic design formed the core of the first iPad mini, which had the same screen pixel count and similar features at a smaller size. The iPad 2 was the only device to receive six major versions of iOS, from 4 to 9; until iOS 12 was released for the iPhone 5S, iPad Air and iPad Mini 2. The iPad 2 was announced at the Yerba Buena Center for the Arts on March 2, 2011. Apple sent invitations to journalists on February 23, 2011, for a media event on March 2. On March 2, 2011, CEO Steve Jobs unveiled the device at the Yerba Buena Center for the Arts, despite being on medical leave. Upon the announcement of the iPad 2, the original iPad was discontinued from sales online and at Apple authorized retail stores. Apple began selling the iPad 2 on its website on March 11, and in its U.S. retail stores at 5 pm local time on that date. Many stores in major cities, such as New York, sold out within hours. Online shipping delays had increased to three to four weeks on Sunday and four to five weeks by Tuesday. The iPad 2 was released internationally in 25 other countries on March 25, 2011. The countries included Australia, Austria, Belgium, Canada, Czech Republic, Denmark, Finland, France, Germany, Greece, Iceland, Italy, Ireland, Hungary, Luxembourg, Mexico, Netherlands, New Zealand, Norway, Poland, Portugal, Spain, Sweden, Switzerland and the United Kingdom. The April 29, 2011 release date for Japan was postponed due to the earthquake and tsunami which struck the nation on March 11, 2011. The iPads were delayed due to the NAND flash storage chip used in the iPads being created by Toshiba, which was affected by the earthquake and tsunami thus resulting in the suspension of operations for an indefinite period of time. The slowdown caused analysts to downgrade Apple's stock. The iPad 2 was later released in Hong Kong, South Korea, Singapore, Philippines, Malaysia and other countries including Japan on April 29, 2011. It was then released in numerous other nations which include China, Estonia, Thailand, Brazil, Russia and Taiwan on two major release dates, May 6 and 27. The 32 and 64GB models were discontinued on March 7, 2012, upon the introduction of the third generation iPad. The 16GB Wi-Fi and 16GB Wi-Fi + 3G models were discontinued on March 18, 2014. In late March 2011, the iPad 2 was released alongside iOS 4.3, which primarily introduced Airplay Mirroring and Home Sharing among other features. On October 12, 2011, upon the release of the iPhone 4S, the iPad was upgradable to the iOS 5 firmware which brought over 200 new user features to iOS compatible devices including Notification Center, iMessage, Reminders, and an updated notifications system, using a new "banner" style instead of the previously used pop-up "alert" style. The iPad 2 comes with several applications by default, including Safari, Mail, Photos, Video, Music, iTunes (store), Maps, Notes, Calendar, Photo Booth, and Contacts. The App Store is also available as a default application, it enables users to download from a database of 800,000 applications, the price of these applications is set by the developers. Like all iOS devices, the iPad 2 can sync music, videos, apps and photos with a Mac or PC using iTunes, although when using iOS 5 and later, the user does not have to connect the iPad to the computer. iCloud also allows users to backup and sync their data with other compatible iOS devices via the internet. Game Center is available as a native social gaming platform on iOS, games downloaded via the App Store that have this feature enabled are able to integrate their achievement points, high-scores and bonus system across all iOS devices into a single accumulative points and social platform. Although the tablet is not designed to make phone calls over a cellular network, a user can use a wired headset or the built-in speaker and microphone and place phone calls over Wi-Fi or cellular using a VoIP application. The iPad 2 also adds the ability to run GarageBand, iMovie, and the iWork apps Pages, Keynote, and Numbers. These applications do not come with the iPad but are instead official applications from Apple sold within the App Store. On March 7, 2012, after the unveiling of the third generation iPad, the firmware of the iPad 2 was upgradable to iOS 5.1. Scott Rohde, a senior Sony executive described the iPad as "a game console disguised as a device that can be appropriated in the business workplace." On September 19, 2012, almost a week after the announcement of the iPhone 5, iOS 6 was released for numerous iOS devices, including the iPad 2. However, on iOS 6, not all features are available on the iPad 2. The software upgrade was downloadable as an over the air (OTA) update package and contains two-hundred new features, including a mapping software designed by Apple dubbed Apple Maps, a "Clock" app, which features a timer, stopwatch and alarm, and Facebook integration among other new features and tweaks. The iPad 2 is compatible with iOS 7, which was released on September 18, 2013. However, some features are not available. For example, like the iPhone 4, the Notification Center and the Control Center use the transparent style instead of the translucent style in later iOS models. Also, AirDrop, which was first released in iOS 7, was only supported by the iPad 4 or later. The iPad 2 can run iOS 8, which was released on September 17, 2014, making it the first iOS device to run five major versions of iOS (including iOS 4, 5, 6, 7, and 8). While the OS runs on the device, most of its new features do not work because of relatively aged hardware and therefore, its performance is limited. Users have also reported numerous problems after receiving the update including the accessibility features and battery-related issues. Many users predicted that the iPad 2 was going to be dropped from updating to iOS 8 along with the iPhone 4, the same process that happened with the iPhone 3GS and the iPod Touch (fourth generation) and earlier models, considering that the model was more than 3 years old. It was confirmed on June 8, 2015, at Apple's WWDC that the iPad 2 would run iOS 9. This made the iPad 2 the first iOS device to run six major versions of iOS. As with previous releases, though, many headline features are unavailable on the iPad 2, including predictive Siri, translucency effects, split-view, slide-over and picture-in-picture multitasking and the Health app. iOS 9 is said to feature performance improvements that may help the aging device function more smoothly, and initial tests suggest that it did not significantly impact available space. Other A5-based devices will also run iOS 9 including the iPhone 4S (five major iOS versions), the iPad Mini (four major iOS versions) and iPod Touch 5G (four major iOS versions). On June 13, 2016, with the release of iOS 10, Apple dropped continuing compatibility with the iPad 2 because of its hardware limitations. The same goes with the iPad (3rd generation) and iPad Mini (1st generation), making iOS 9 the final version that will run on the device. In July 2017 the critical WiFi vulnerability BroadPwn affecting many iOS devices, including the iPad 2 was published. It allows an attacker to remotely take control of all affected devices within WiFi range without any user interaction. Since iOS 9 is in its end of life the iPad 2 won't receive a security patch for this vulnerability, making it dangerous to use them further. In January 2018, Apple suddenly started firmware signing for iOS 6.1.3 on the iPad 2 and iPhone 4S, allowing users to downgrade these devices to iOS 6. iOS 8 is available as an over-the-air update on iOS 6, allowing users to update their devices to iOS 8.4.1. As of April 2019, this is still supported. The iPad 2 features an Apple A5 package-on-package (PoP) System-on-chip (SoC), which comprises a 1 GHz dual-core 32-bit Cortex-A9 CPU, 512 MB of RAM and a dual-core PowerVR SGX543MP2 GPU. Other features include front and rear cameras, a three-axis gyroscope, headset controls, proximity and ambient light sensors, microphone, magnetometer, accelerometer and a 9.7 inch multi-touch screen with a maximum resolution of 1024×768 hence resulting in 132 ppi. The iPad 2 has four physical switches, including a home button near the display that returns the user to the home screen, and three plastic physical switches on the sides: wake/sleep, volume up/down, and a third switch for either screen rotation lock or mute. The home button on the iPad 2 is "easier to double tap" than the previous generation of the iPad. Apple reduced the size of the iPad by eliminating the stamped sheet metal frame from the display, integrating new thinner glass technology for the touch screen overlay, and slightly reducing the space between the display and battery. The iPad 2's screen is thinner, lighter, and yet stronger than the original iPad's. The iPad 2 also supports screen mirroring via the digital AV adapter and through AirPlay as of iOS 5. The iPad 2 has a 25 W·h rechargeable lithium-ion polymer battery that lasts 10 hours, like the original iPad. It is charged via USB or included 10 W, 2 A power adapter. The battery is 2.5 mm thick, 59% smaller than the original and has three cells instead of two. The improvements allowed the injection-molded plastic support frame to be omitted. The 10 W USB power adapter provides 4x the power of a conventional USB port. The tablet has an audio frequency response of 20 Hz to 20 kHz. Without third-party software it can play the following audio formats: HE-AAC, AAC, Protected AAC, MP3, MP3 VBR, Audible formats (2, 3, 4, AEA, AAX, and AAX+), ALAC, AIFF, and WAV. The revised tablet adds front- and rear-facing cameras, which allow FaceTime video calls with other iPad 2s, the third generation iPad, iPhone 4 and 4S, fourth-generation iPod Touch and Macintosh computers (running Mac OS X 10.6.6 or later with a webcam). The 0.3 MP front camera shoots VGA-quality 30 frame/s video and VGA-quality still photos. The 0.7 MP back camera can shoot 720p HD video at 30 frame/s and has a 5× times digital zoom. Both shoot photo in a 4:3 fullscreen aspect ratio. The rear camera shoots video in 16:9 widescreen to match the 720p standard, although only the central 4:3 part of the recording is shown on the screen during recording. The forward-facing camera shoots in 4:3. 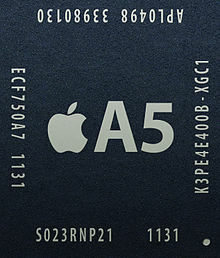 The Apple A5 chip doubles processing speed and has graphics processing that is up to nine times faster than the previous iPad. However, benchtests and hardware assessments performed by various third party news sources and technology blogs indicate that those claims are exaggerated; the benchmark assessment conducted by Anandtech showed that the GPU of the iPad 2 is only 3 times faster than that of the original iPad. CPU benchmarks conducted on the iPad 2 by iOSnoops indicate a 66% performance increase compared to the original iPad. 3G versions of the iPad 2 offer CDMA2000 support for customers using the device on a CDMA network or GSM/UMTS support for customers using the device on a GSM/UMTS network. The iPad Wi-Fi + 3G model includes an A-GPS receiver for tracking the user's location given permission. Also, the iPad 2 3G model includes a plastic cap-like band at the top on the back for the 3G antenna. The metallic grille for the microphone is replaced with a matching plastic black grille on the 3G model. GSM models of iPad 2 use a SIM card while CDMA models use an ESN to connect to the cellular network. The device is 15% lighter and 33% thinner than the original iPad; it is thinner than the iPhone 4 by 0.5 mm. The Wi-Fi version is 1.33 lb (600 g). Both the GSM and CDMA versions (known respectively as the AT&T and Verizon versions in the US) differ in weight slightly due to the mass difference between the GSM and CDMA cellular radios, with the GSM model at 1.35 lb (612 g) and the CDMA model at 1.34 lb (608 g). The size of the iPad 2 is also less than the original iPad at only 9.50×7.31×0.34 in (241.2×185.7×8.8 mm), compared to the original iPad's size at 9.56×7.47×0.5 in (242.8×189.7×13.4 mm). After the announcement and release of the third generation iPad, the iPad 2, which continued to be available for purchase, received a hardware upgrade. The upgraded variant of the iPad 2 features a smaller version of the Apple A5 SoC, which is able to reduce battery consumption. Benchmark tests conducted by Anandtech concluded that the upgraded variant is able to last longer by at least an hour and a half, depending on the task that is conducted on the device. The maximum temperature that the device heated up to was also less than original iPad 2, tests conducted by the same organisation revealed that the upgraded variant was able to operate at 1 degree lower when performing intensive tasks. Performance difference between the two variants, according to Anandtech is negligible. The Smart Cover, first introduced with the iPad 2, is a screen protector that magnetically attaches to the face of the iPad. The cover has three folds which allow it to convert into a stand, which is also held together by magnets. While original iPad owners could purchase a black case that included a similarly folding cover, the Smart Cover is meant to be more minimal, easily detachable, and protects only the screen. Smart Covers have a microfiber bottom that cleans the front of the iPad, and wakes up the iPad when the cover is removed. There are five different colors of both polyurethane and leather, with leather being more expensive than the polyurethane version. Apple offers several more accessories for the iPad 2, most of which are adapters for the proprietary 30-pin dock connector, the iPad's only port besides the headphone jack. A dock holds the iPad upright at an angle, and has a dock connector and audio line out port. The iPad can use Bluetooth keyboards that also work with Macs and PCs. The iPad can be charged by a standalone power adapter ("wall charger") also used for iPods and iPhones, and a 10 W charger is included with the iPad. "Though the iPad 2 is an improvement on the original iPad in numerous ways, it’s still an evolutionary product, not a revolutionary one. If you’re happy with your current iPad, there’s no reason to dump it just because there’s a shinier, newer one. (This is not to say that millions of people won’t do just that. I mean: shiny!) If you’ve invested in iPad accessories such as a dock or case, keep in mind that you probably won’t be able to use them with the new iPad." TechCrunch's MG Siegler stated: "Let me sum all of this up in a simple way: the iPad 2, should you buy one? Maybe — it depends on a few factors. Will you want to buy one? Yes. Use that information wisely." The closed and proprietary nature of iOS has garnered criticism, particularly by digital rights advocates such as the Electronic Frontier Foundation, computer engineer and activist Brewster Kahle, Internet-law specialist Jonathan Zittrain, and the Free Software Foundation who protested the iPad's introductory event and have targeted the iPad with their "Defective by Design" campaign. Competitor Microsoft, via a PR spokesman, has also criticized Apple's control over its platform. At issue are restrictions imposed by the design of iOS, namely DRM intended to lock purchased media to Apple's platform, the development model (requiring a yearly subscription to distribute apps developed for the iOS), the centralized approval process for apps, as well as Apple's general control and lockdown of the platform itself. Particularly at issue is the ability for Apple to remotely disable or delete apps at will. Some in the tech community have expressed concern that the locked-down iOS represents a growing trend in Apple's approach to computing, particularly Apple's shift away from machines that hobbyists can "tinker with" and note the potential for such restrictions to stifle software innovation. Some iPad 2 users reported performance issues when running iOS 8. Apple improved performance on the iPad 2 and the iPhone 4S on the iOS 8.1.1 update. However, those 2 devices still don't run as fast as the later models. During the first weekend of sale, more than one million units were sold. Soon after the first weekend, Ashok Kumar, a technology analyst for a financial firm predicted that Apple would sell 35 million iPad 2s in 2011. Investment banking firm, Piper Jaffray monitored the initial sales of the iPad 2 and reported that 70% of all iPad 2 sales were to first-time iPad buyers with 49% of buyers owning a PC compared to the initial buyers of the original iPad where only 26% of buyers owned a PC. 12,000 units were sold on auction site eBay in its first two weeks of release. When the iPhone 4S was released, rumors about the third generation iPad caused a decline in iPad 2 sales. Official figures released in the fourth quarter of 2011 indicate that Apple sold 11.4 million iPads in the third quarter, a 166% increase from the third quarter of 2010. The product helped create newer, larger markets for Apple in south east Asia. In 2011 two iPad 2 tablets were taken to the International Space Station after being approved. Other Apple products that were taken to ISS include the iPod and also two iPhone 4 phones. The other personal computing system aboard ISS were various versions of the ThinkPad laptop (IBM, later Lenovo brand). Some of the applications the iPads were used for include Angry Birds game and the ISS FIT (International Space Station Food Intake Tracker) for tracking astronauts food consumption. ^ Siegler, MG. "TechCrunch Review – The iPad 2: Yeah, You're Gonna Want One". TechCrunch. AOL. Retrieved March 10, 2011. ^ a b c d e f g h i j "Technical specifications and accessories for iPad 2". Apple. January 27, 2010. Retrieved June 30, 2012. ^ Johnston, Casey (2011). "iPad 2: Faster, thinner, lighter; same battery, display resolution". Ars Technica. Condé Nast Publications. Retrieved March 10, 2011. ^ "Apple iPad 2 GPU Performance Explored: PowerVR SGX543MP2 Benchmarked". AnandTech. Retrieved March 21, 2011. ^ a b Gruener, Wolfgang (March 8, 2008). "5 Reasons Why You Should Not Buy The iPad 2". Tom's Guide. Retrieved March 10, 2011. ^ "iPad 2 Wi-Fi EMC 2415 Teardown". iFixit. March 11, 2011. Retrieved October 17, 2014. ^ a b c Topolsky, Joshua (March 9, 2011). "iPad 2 review". Engadget. AOL. Retrieved April 18, 2012. ^ a b "Apple's Trend Away From Tinkering". Slashdot. January 31, 2010. Retrieved April 15, 2012. ^ Yarow, Jay (April 6, 2011). "iPad 2 Sales Pegged At ~2.5 Million Units For March". Business Insider. Retrieved June 29, 2012. ^ a b Jordon, Patrick (October 18, 2011). "iPad Sales Numbers for Q4 2011 Announced by Apple". iPad Insight. Retrieved June 29, 2012. ^ Ionescu, Daniel (February 22, 2011). "iPad 2 Could Be Unveiled March 2". PCWorld. IDG. Retrieved April 23, 2012. ^ Sande, Steven (February 25, 2011). "Engadget: iPad 2 thinner, faster, has cameras, no SD slot or high-res display". The Unofficial Apple Weblog. AOL. Retrieved April 23, 2012. ^ Helft, Miguel (January 17, 2011). "Apple Says Steve Jobs Will Take a New Medical Leave". The New York Times. The New York Times Company. Retrieved January 17, 2011. Jobs announced that the iOS 5.0 operating system would be available March 9, 2011. ^ "Apple iPad Wi-Fi (Original) 16, 32, 64GB Specs". EveryMac. Retrieved June 30, 2012. ^ "Apple Store: iPad 2". Apple. March 2, 2011. Retrieved March 10, 2011. ^ Smith, Catharine (March 17, 2011). "The Most Expensive time to buy an iPad 2". The Huffington Post. AOL. Retrieved April 23, 2012. ^ Kane, Yukari Iwatani; et al. (March 13, 2011). "Apple's iPad 2 Chalks Up Strong Sales in Weekend Debut". The Wall Street Journal. Dow Jones & Company. Retrieved March 13, 2011. ^ Cromwell Schubarth, Silicon Valley/San Jose Business Journal (March 15, 2011). "Apple's iPad 2 Chalks Up Strong Sales in Weekend Debut". American City Business Journals, Inc. Retrieved March 20, 2011. ^ Moren, Dan (March 22, 2011). "Apple confirms international iPad 2 launch on March 25". Macworld. Mac Publishing. Retrieved April 23, 2012. ^ Emily Banks (March 15, 2011). "Apple Delays iPad 2 Launch in Japan". Mashable. Retrieved March 15, 2011. ^ TheStreet staff (March 16, 2011). "Apple shares fall as iPad 2 delayed in Japan". MSN Money. Microsoft. Retrieved March 20, 2011. ^ "Apple to sell iPad 2 in 25 more countries at 5 pm local time on Friday". AppleInsider. AppleInsider, Inc. March 22, 2011. Retrieved March 22, 2011. ^ Josh Ong (May 6, 2011). "Apple's iPad 2 launch in China draws crowds, scalpers". Apple Insider. Retrieved June 27, 2012. ^ "Pictures: iPad 2 Launches In China And Thailand To Yet More Lines". Macstories. May 6, 2011. Retrieved June 27, 2012. ^ Perenson, Melissa J. (March 30, 2012). "New iPad vs. iPad 2: Which is the Better Deal?". PCWorld. IDG. Retrieved April 23, 2012. ^ "Apple iOS 4.3 coming March 11 with iPad 2, includes new AirPlay features and FaceTime". Engadget. AOL. March 2, 2011. Retrieved April 17, 2012. ^ Dachis, Adam (October 12, 2011). "Everything You Need to Know About iOS 5 in Seven Minutes". Lifehacker. Gawker Media. Retrieved May 3, 2012. ^ "The new iPad – Amazing iPad apps, built right in". Apple. March 7, 2012. Retrieved March 14, 2012. ^ Caldwell, Serenity (October 15, 2011). "Up close with iOS 5: Wireless syncing and updating". Macworld. Mac Publishing. Retrieved April 23, 2012. ^ "Game Center". Apple. Retrieved June 30, 2012. ^ Sarno, David (January 29, 2010). "Apple confirms 3G VoIP apps on iPad, iPhone, iPod touch; Skype is waiting". Los Angeles Times. Retrieved March 31, 2012. ^ Jim Ankan Deka (September 14, 2011). "iPad – the Musician's Genie". EF News International. Archived from the original on October 30, 2011. Retrieved October 21, 2011. ^ "Apple Launches New iPad". Apple. March 7, 2011. Retrieved April 17, 2012. ^ Nutt, Christian (February 21, 2012). "The Vita Interview". Gamasutra. UBM TechWeb. Retrieved May 3, 2012. ^ a b "What's new in iOS 6? Here's the changelog". Slashgear. September 19, 2012. Retrieved December 15, 2012. ^ "Apple devices that aren't invited to the iOS 7 party". CNET. CBS Interactive. ^ "iOS 8 is compatible with iPhone 4S, iPad 2 or later". iDownload Blog. June 2, 2014. Retrieved June 2, 2014. ^ Andrew Cunningham (September 16, 2015). "iOS 9 on the iPad 2: Not worse than iOS 8, but missing many features". Ars Technica. ^ Andrew Cunningham (September 16, 2015). "iOS 9, thoroughly reviewed". Ars Technica. ^ "iOS 10 – Apple". ^ Nitay Artenstein (July 26, 2017). "Broadpwn: Remotely Compromising Android and iOS via a Bug in Broadcom's Wi-Fi Chipsets". Exodus Intelligence. ^ Andrew Walters (August 1, 2017). "Thousands of iPad 2 tablets in schools just became ticking timebombs". Sirius. ^ "Apple's A5 CPU in iPad 2 has 512MB of RAM, same as iPhone 4". Appleinsider.com. March 3, 2011. Retrieved March 15, 2011. ^ Frommer, Dan (March 21, 2011). "Here's Why I'm Waiting For The iPad 3". Business Insider. Silicon Valley Insider. Retrieved March 21, 2011. ^ a b Frank Michael Russell (March 19, 2011). "Tech Notebook: Apple's svelte new iPad 2: its weight-loss secrets revealed". San Jose Mercury News. Retrieved March 20, 2011. ^ Carnoy, David (March 25, 2011). "Apple uses stronger glass in iPad 2". Cnet. CBS Interactive. Retrieved May 3, 2012. ^ "Developers debate iPad 2 video mirroring copyright issues". iLounge. March 4, 2011. Retrieved June 5, 2011. ^ Goldman, David (March 2, 2011). "iPad 2: Thinner, faster, and with a Steve Jobs surprise". CNNMoney. Time Warner. Retrieved March 2, 2011. ^ Horsley, Julian (May 24, 2011). "Apple iPad 2 Review". Geeky Gadgets. Retrieved June 29, 2012. ^ Biggs, John (March 2, 2011). "Apple Announces The iPad 2: A5 Processor, Front And Back Cameras, Available March 11". Retrieved March 12, 2011. ^ "IPad 2 – It's Thin, Light, and Fully Loaded". Apple. October 27, 2011. Archived from the original on March 16, 2011. Retrieved April 17, 2012. ^ Anand Lal Shimpi (March 12, 2011). "Apple iPad 2 GPU Performance Explored: PowerVR SGX543MP2 Benchmarked". Anandtech. Retrieved April 17, 2012. ^ "Early iPad 2 & Apple A5 Benchmarks – Up to 65-Percent Faster than iPad & Apple A4". iOSnoops. March 12, 2011. Retrieved April 17, 2012. ^ Kahn, Jordan (March 30, 2012). "Benchmarked: New iPad's A5X vs iPad 2′s A5 vs Tegra 3". MacRumors. Retrieved May 3, 2012. ^ Klug, Brian (March 19, 2011). "The Apple iPad 2 Review". Anandtech. Retrieved June 30, 2012. ^ Adrian Kingsley-Hughes (August 8, 2011). "iPad vs. iPad 2 – What's changed?". Retrieved March 3, 2011. ^ "iPad – Technical Specifications". Apple Inc. August 20, 2011. Retrieved April 17, 2012. ^ a b c Shimpi, Anand Lal (May 4, 2012). "The iPad 2,4 Review: 32nm Brings Better Battery Life". Anandtech. Retrieved January 1, 2013. ^ "iPad 2 Smart Cover Teardown". iFixit. Retrieved May 12, 2012. ^ "Apple – Smart Cover". Apple. March 2, 2011. Retrieved May 12, 2012. ^ Wright, Josh (October 24, 2011). "iPad 2 Smart Cover colors revised". Macgasm. Retrieved May 12, 2012. ^ "iPad must-haves. And fun-to-haves". Apple. Retrieved April 16, 2012. ^ a b "Apple – The new iPad – View all the technical specifications". Apple. Archived from the original on January 30, 2010. Retrieved March 10, 2012. ^ Frakes, Dan (April 14, 2012). "iPad Keyboard Dock or Bluetooth Keyboard?". PCWorld. Retrieved May 12, 2012. ^ Snell, Jason (March 9, 2011). "Review: The iPad 2". Macworld. Mac Publishing. Retrieved April 19, 2012. ^ Siegler, MG (March 9, 2011). "TechCrunch Review — The iPad 2: Yeah, You're Gonna Want One". TechCrunch. AOL. Retrieved April 21, 2012. ^ "iPad DRM endangers our rights". Defective by Design. February 3, 2012. Retrieved April 19, 2012. ^ Nate Anderson (January 27, 2010). "Protestors: iPad is nothing more than a golden calf of DRM". Retrieved April 15, 2012. ^ "Mobile Devices and the Next Computing Revolution". February 3, 2010. Retrieved April 15, 2012. ^ Bobbie Johnson (February 1, 2010). "Apple iPad will choke innovation, say open internet advocates". The Guardian. Retrieved April 15, 2012. ^ Worthington, David (January 28, 2010). "Microsoft PR spokesman condemns iPad for being "locked down"". Technologizer. Retrieved April 19, 2012. ^ Steve Wozniak (Interviewee) (January 22, 2011). Campus Party Brasil 2011 – Geek Pride e Wozniak. Fragoso, Victor. Retrieved March 7, 2011. ^ Madway, Gabriel (March 14, 2011). "Apple iPad 2 sales seen clearing 1 million units". Reuters. Thomson Reuters. Retrieved April 19, 2012. ^ Satariano, Adam (March 11, 2011). "Apple Poised to Sell 600,000 IPad 2s in Its Debut, Outpacing First Model". Bloomberg. Retrieved March 14, 2011. ^ Elmer-DeWitt, Philip (March 13, 2011). "Piper Jaffray: iPad 2 totally sold out, 70% to new buyers". CNN Tech. Time Warner. Retrieved May 5, 2012. ^ Lowensohn, Josh (March 31, 2011). "eBay reveals its iPad 2 sales data". Cnet. CBS Interactive. Retrieved May 5, 2012. ^ Hodgkins, Kelly (December 12, 2011). "Could DigiTimes rumors affect holiday iPad 2 sales?". The Unofficial Apple Weblog. AOL. Retrieved May 9, 2012. ^ Apple Inc. (2010–2011). iPad News - Newsroom Archive. Retrieved June 7, 2018. Wikimedia Commons has media related to iPad 2. This page was last edited on 14 April 2019, at 12:12 (UTC).